CHULA VISTA — After the implosion of South Bay’s obsolete power plant, the demolition and recycling of over 24,400 tons of metal and debris, and the release of conceptual plans to make Chula Vista Bayfront into a “world-class” destination, San Diego is ready to take another step toward South Bay renewal: the extension of H Street. The San Diego Board of Port Commissioners’ approval of plans for the Bayfront Sept. 10 was a long-awaited decision. The H Street extension project will connect the Chula Vista Bayfront to the main streets in the area, which planners believe will enhance and encourage public access to the waterfront for vehicles, cyclists and pedestrians, increasing revenue for existing businesses and attracting future investments. H Street currently ends at Bay Boulevard. 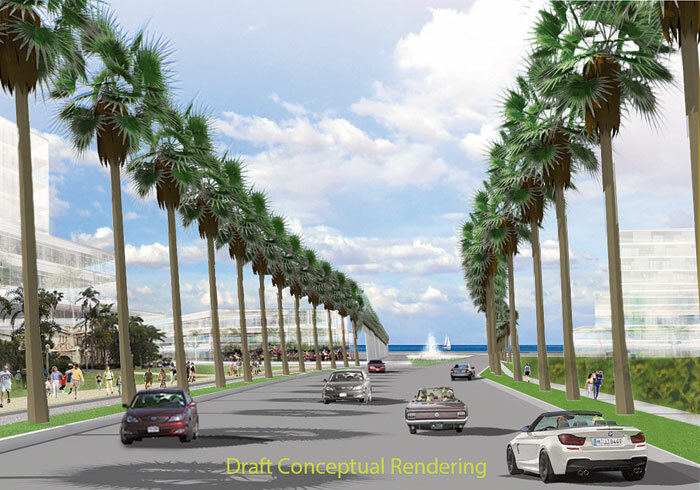 The project will extend that public roadway into a four-lane road with a 12-foot-wide Class 1 bikeway on either side of the sidewalk, all the way to Marina Parkway. Marina Parkway will also be extended southerly from H Street to Sandpiper Way. The roadway extension will total 1,800 feet in length. The project will also feature improvements to landscaping, drainage systems, water transmission lines and street lights. In adopting the plans for the project, the board has also approved a $7.2 million contract with LB Civil Construction Inc., which was selected through a competitive bidding process. The project envisions a master plan — a destination on more than 500 acres of prime waterfront property dedicated to hotels and convention facilities, homes, shops and restaurants, and more than 240 acres of parks and nature preserve. “The opening of H Street is yet another example of progress and improvement occurring on Chula Vista’s Bayfront,” said Chula Vista Mayor Cheryl Cox. The process is projected to create thousands of jobs — 7,000 in construction, and 2,200 permanent positions — and to generate more revenue for public services, including police, fire protection and parks. A groundbreaking ceremony will be scheduled later this year.